We believe "Every fiber has a time. Every stitch has a place. Every pattern has a memory. Every quilt has a story to tell... and so do you. Start sharing yours today!" Northern Threads offers a variety of classes and supplies, covering everything quilting, sewing, embroidery. Choose from our large selection of fabric for quilting Our quilting supplies, just like our other products, are top quality and can’t be beat. We are an authorize Pfaff and Viking sales and service center. While the company's grown from a tiny little shop to a 4600sq ft. store and online store, Northern Threads promise of your satisfaction guaranteed remains most important to us. 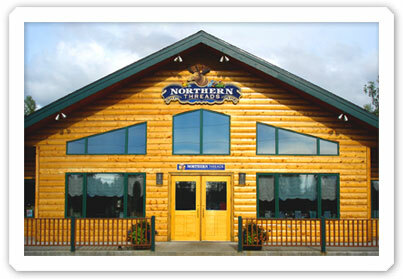 Northern Threads is the place "Where Traditions Begin", we look forward to seeing you! In 1996 Marie Noah began the business as Quilting Trail in a compact 700 square foot space in the small town of North Pole, Alaska, providing professional quilting service and fabric. By 2008 the shop had expanded twice, and sewing machines and yarn were added to the retail mix, bringing on the need to undergo a name change. We're quilters, knitters and crocheters, too! We like all the colors in the spectrum, soft fabric, yummy yarns, beautiful threads and all the best tools and gadgets available. We like patterns for projects that are interesting, but never confusing. Ultimately we like to make and use things you like to make and use! The staff here at Northern Threads is experienced and knowledgeable when it comes to selecting knitting, sewing, quilting and embroidery supplies and accessories for your next project.